1.) Unscrew the cap from the 10 mg Bee Venom vial. 2.) Point the 0.9% Na-Cl-syringe upward and unscrew the end cap. 3.) Pull down the plunger until it stops, to fill it with air. 4.) Screw back the end cap. 5.) Remove the plunger and knock down the bee venom into the syringe, put back the plunger. 6.) Shake the syringe to dissolve the bee venom. 7.) Detach the syringes end cap again. 8.) Attach the filter to the syringe (by turning). 9.) Attach the needle at the end of the filter (without removing the needles safety cap). 10.) Pull off the needles safety cap. 11.) Clean the rubber stopper on top of the vial with an alcohol wipe. 12.) Push down the needle in the sterile vial and fill it with the solution. 13.) Pull out the needle and put back the safety cap. Now you have sterile bee venom solution in a sterile vial. Use insulin syringes to inject the bee venom solution. Start the first application with 0.1 - 0.2 ml or less, and after one week, or three applications, work up to 0.3 - 0.5 ml per injection. Abort your treatment if you have too severe reactions. Alternate the injection sites and follow a schedule of three times per week. Normally Monday, Tuesday and Friday. It's very important that you do subcutaneous injections, not intramuscular ones. Giving yourself a subcutaneous injection means inserting medication into the fatty areas just under your skin. The needle used for a sub-Q injection is very small and doesn't cause much pain. Many medications are given in this way. Clean your area with soap and water. If you are very thin, don’t use the abdomen for your injection site. Rotate your injection sites. Choose a site that is at least 2 inches away from your last injection site. Check the bee venom solution in the vial for changes in color, debris, or cloudiness. Don’t use the bee venom solution if you notice anything different about the contents of the vial. Clean the rubber stopper on top of the vial with an alcohol wipe. Take the cap off the needle. Pull back the plunger, drawing air into the syringe. The amount of air should be the same as the amount of bee venom solution you are going to inject. Push the needle into the rubber stopper of the vial. Once the needle is through the stopper, push the plunger on the syringe so that the air goes into the vial. Keep the tip of the needle in the liquid and pull back on the plunger. The bee venom solution will flow into the syringe. If you get too much, push some solution back into the vial with the plunger. If you didn't get enough, continue pulling on the plunger. If you see air bubbles in the syringe, gently tap the syringe while the needle is still in the stopper. The air bubbles will move to the top of the syringe. Check to make sure the syringe contains the correct amount of bee venom solution. Then pull the needle out of the vial. Using an alcohol swab, clean the injection site. Make sure the cleaned area is about 2 inches in diameter. While the injection site dries, double-check that you have the right amount of bee venom solution in your syringe. Place your thumb and forefinger on either side of the clean injection site. Pinch up about 5 cm (2 inches) of skin. 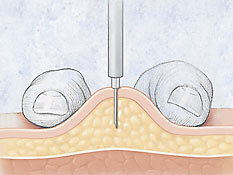 Insert the needle at a 45° or 90° angle into the pinched-up skin. Do this quickly; it will hurt less. Be sure to insert the needle with the bevel up and insert all the way to the end of the needle. This will help you inject the bee venom solution correctly. To see if you are getting too deep you can pull back on the plunger. If you see blood in the syringe, don’t inject. This means that the needle has entered a blood vessel. Withdraw the needle, select a new injection site, and repeat the steps above for preparing the site. If there is no blood in the syringe, continue with the injection. To inject the bee venom solution, slowly push the plunger all the way down. Remove the needle from the skin and hold a gauze or cotton ball on the injection site for a few seconds. Don’t rub the injection site. If you see blood or clear fluid, press on the injection site with the gauze or cotton ball for 5 to 8 minutes. Apply a bandage if you wish. Put the empty syringe in the disposal container. This site does not provide medical or any other health care or fitness advice, diagnosis, or treatment. The site and its services, including the information above, are for informational purposes only and are not a substitute for professional medical or health advice, examination, diagnosis, or treatment. Always seek the advice of your physician or other qualified health professional before starting any new treatment, or making any changes to existing treatment.